Meet Hub – Interviews, Girls Race, Boys Race! The much anticipated 2017 Cofrin Classic was held at NHTI Community College in Concord. The flat and fast course meanders gently through well-kept fields along beautiful running trails that encompass Fort Eddy Pond. 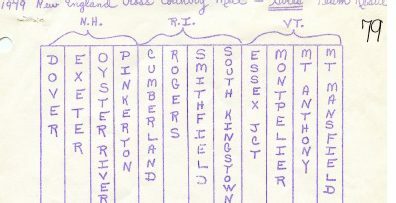 The girl’s race featured Coe-Brown and Hanover, which are two of the most decorated cross country programs in NH History and contenders for the 2017 Division II Title. Three time state middle school cross country champion and now Coe-Brown freshman Addison Cox took very little time transitioning to the high school level. Right from the beginning she went to the front and never looked back running comfortably unchallenged throughout the race. Her time of 19:12 looked almost effortless as she led a 1,2,3, sweep for the CBNA girls. Finishing in second was senior Eleanor McDonough (19:41) and sophomore Abigail O’Connor was 3rd (19:44). 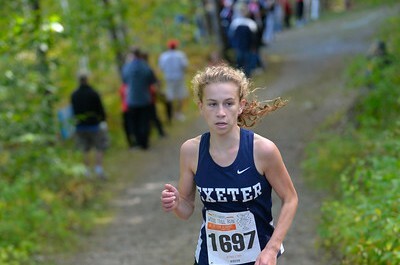 Hanover junior Leila Trummel spent much of the race in second place but settled for 4th (20:01). Two freshman battled it out to the finish with Bedford’s Carly Rinko finishing in 5th just edging out CBNA Ella Malone in identical times of 20:13. Division III contender Leah Dutkewych of White Mountains ran a stellar race placing 7th in 20:40 just ahead of Concord freshman Morgan Orcutt in 20:46. Kenndy Lange (Hanover) placed 9th in 20:48 edging Molly Bragg of Concord (20:51) and Elsa Nordstrom (11th) of Hanover. Coe-Brown’s (NH#5) power up front was too much for Hanover’s (NH#4) comparable depth as they won 31-54. Bedford ran a solid 3rd with 66 points outdistancing host Concord’s 79 points and White Mountains 5th place score of 133 points. The boys’ individual race came down to a battle of chess between two former Deerfield middle school teammates that knew all too well each other’s best moves. At about two miles, Coe-Brown senior Evan Tanguay surged to the front to try and break Concord junior Forest MacKenzie. The gap that was created wasn’t quite big enough to hold off MacKenzie and with a 1000 yards to go MacKenzie was back in it and stalking Tanguay ready to deliver a tactically devastating kick. At about 500 yards, MacKenzie made his move, powering to the lead for good, winning in 16:16. Tanguay valiantly finished 2nd in 16:21 in front of what looked like an army of Crimson Tide. Eli Boesch Dining (3rd 16:36) led Concord to a sweep of the next ten places, Colin Conery (4th 16:40), Nate Nichols (5th 16:41), Oliver Spencer (6th 16:50), Alex Duncan (7th 16:54), David Cook (8th 16:56), Matt O’Brien (9th 17:05), freshman Brayden Kearns (10th 17:06) and Ryan Devine (11th 17:33). Concord (NH#1) won the team title with 19 points. Coe-Brown placed second with a respectable 44 points while Hanover was 3rd with 88 points. Bedford edged Manchester Memorial in a tie breaker for 4th as White Mountains was 6th with 190 points.